The hairdressing industry is nothing like it was five years ago, let alone a decade ago, and keeping up with the latest trends can be hard if you’re stuck in daily routines. 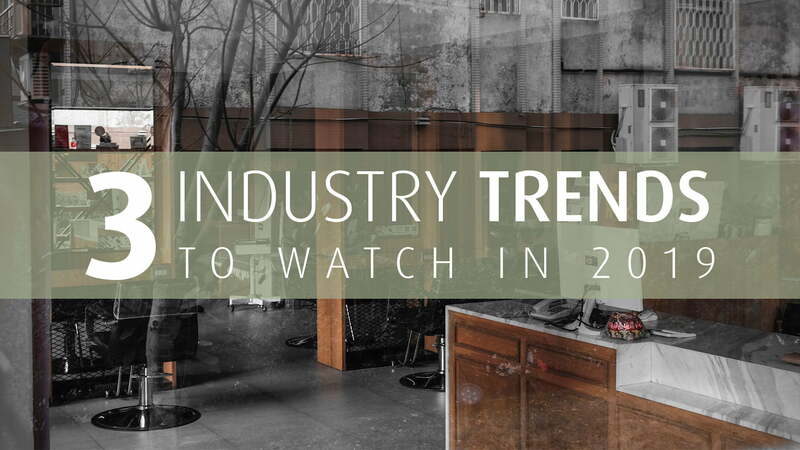 In this blog, we have gathered three salon trends worth watching in 2019. Free wifi, charging stations, digital booking systems, automatic text confirmations and booking reminders are just a few of many tech-tendencies in the salon industry today. So, if you haven’t boarded this ship yet, now is the time. The many digital booking systems on the market make it easier for customers to book appointments and also help you keep track of their hair history and previous formulas, while saving precious time for your staff. Rather than spending time on booking requests, your hairdressers have more time to care for and consult their clients. But also regarding consultation, digital innovations can make life as a hairdresser easier. Simple mobile apps, 3D colouration technology, and virtual reality applications – there are endless opportunities to assist your client in finding the right look. Another digital trend not to be neglected in 2019 is Social Media and the collaboration with beauty influencers. Instagram reached 800 million monthly users in September 2018 and predicts that they will count a staggering billion users in 2019. Therefore, it can be a great investment to spend time on building partnerships with local influencers and beauty bloggers that share your salon values and aesthetic. With their local reach and already established network, they can help you grow your business and spread the word about your unique services. Besides influencer marketing, there is a number of ways to make use of digital marketing. To help you, we have gathered 4 simple ways to improve your salon’s web presence. The “spalon” is currently taking the industry by storm. As a full-service salon that offers e.g. hair, skin, nail design and particularly wellness treatments all-in-one, it is not only a true treasure for clients with time constraint, but also a great way for salon owners to grow their businesses. Krissy Herrera, Stylist and Partner of Facetté the Hair Experience explains, why she believes more salons should take this opportunity. The reality of climate change, global warming and long-term environmental damage on our planet is starting to become more visible every day. We’re happy to see, that today far more salons are committed to sustainability by incorporating eco-friendly practices in their salon life, than 20 years ago, when we just started NATULIQUE. From reducing plastic use in the salon to taking public transportation to work, the ways for hairdressers to improve their ecological footprint are countless and simple. We’ve rounded up 8 easy ways to improve your salon’s ecological footprint. Plastic pollution is one of the major environmental problems we’re faced with today. So what are the biggest culprits lurking in salon bins and how can you reduce them? This graphic illustrates a few easy tips you can apply to reduce plastic use and make your salon life more sustainable. Next to taking better care of our planet, we have also become more aware of our own health. Organic hair care products are therefore inseparable from the idea of an eco-salon. Grounded in the organic philosophy, at NATULIQUE we truly believe that this movement will continue to grow. Below, we have gathered four benefits of organic hair care.